If you’re wondering where the hottest place in Canada is this summer, it very well may be the CSE. 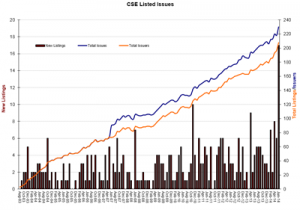 With a new record high number of listings in June 2014, the CSE is on pace to have its best year yet in terms of listings and trading activity and there is still plenty of time left on the calendar. As we cross the halfway mark of 2014, the CSE has already seen 35 new listings join the exchange to date with 13 new listings added in June. The previous record for listings in a month was 10 (December 2010) and the previous high number of listings within a year (37) is within reach. New listings weren’t the only highlight, however, as trading volumes were equally as impressive. Over 257 million shares traded in June making it the third highest (so far) in terms of trading activity. This past year has seen a surge in interest from public companies large and small who are looking to enhance their competitiveness by focusing on efficient use of capital. In this regard, the CSE continues to be an important option to consider, especially for entrepreneurially minded organizations. While cost control is key, many companies also know that growth also comes with increased exposure. The OTC Market Group’s recent announcement of the CSE as a qualified foreign stock exchange means that companies can now have enhanced access to wider pools of capital across the continent. Like many of the entrepreneurs on and considering the exchange, the summer will continue to be a busy one. That said, despite the heat outside, the CSE and its supporters will be looking forward to a forecast that goes into the upper 30’s and beyond.